Two and a half years after demolition of the Stix Baer & Fuller department store and adjoining River Roads Mall buildings, much of the site has returned to nature, at least for now. 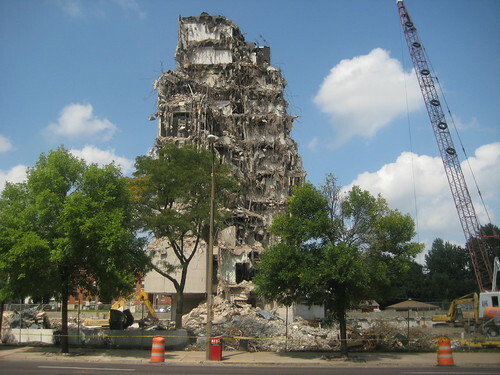 Pyramid Companies had plans to redevelop the site mostly with single family homes, but with the collapse of the market for new homes and Pyramid, the land continues to sit vacant. 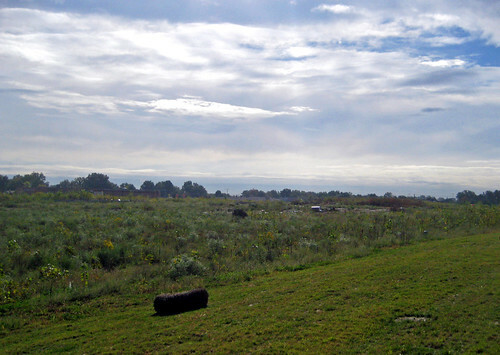 Beyond the new prairie to the left is a row of new houses facing Cozens that were completed by Pyramid Companies. At center is an abandoned former Boatman's Bank and to the right peeking out from behind the hillside, the roof of an senior apartment building off Halls Ferry, also completed by Pyramid. 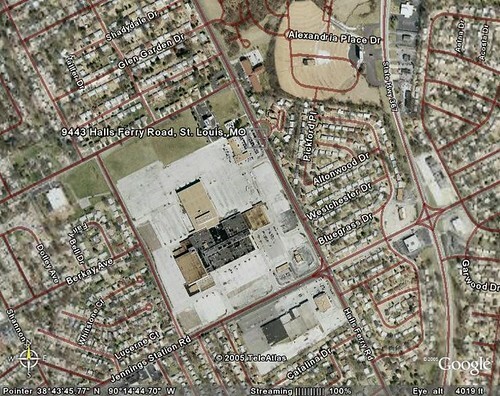 A 2005 aerial show the site at Halls Ferry and Jennings Station Road mostly covered with asphalt and the River Roads Mall buildings. 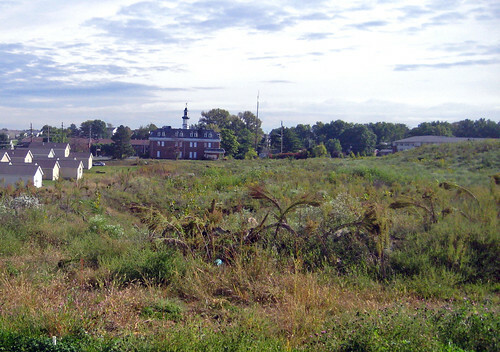 Ironically, a small section of grass along Cozens in this view is one the few areas that was re-developed. A large pile of rubble also sits south of where Stix Bear and Fuller was located. 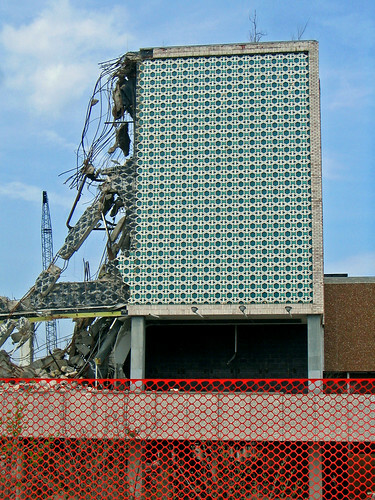 The last of the quilt-like wallpaper of terra cotta which covered SBF's east facade as it appeared in April 2007 during the mall's demolition. The work was one of the largest installations of Modern terra cotta in the region. 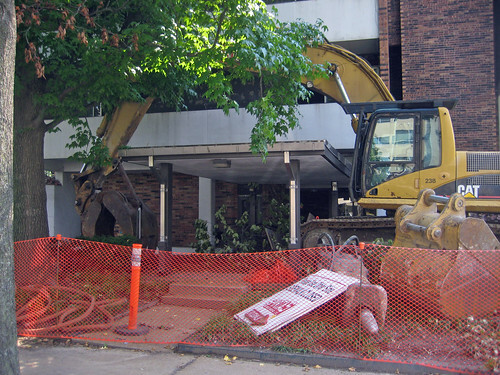 For more photos of the demolition, check out my Flickr set. 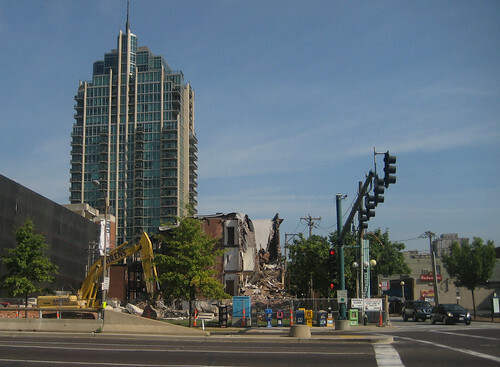 Ecology of Absence and Built St. Louis both have great pre-demolition photos. 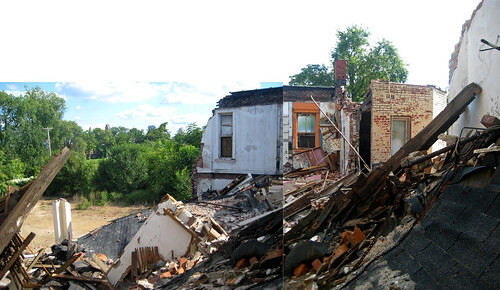 Two similar properties, two different owners, two dramatically divergent outcomes. 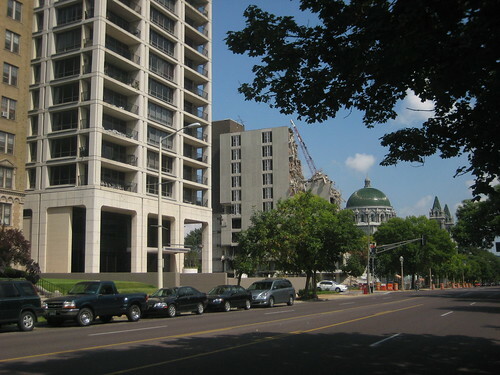 Less than three blocks separates two very similar buildings on St. Louis Avenue in the St. Louis Place Neighborhood. 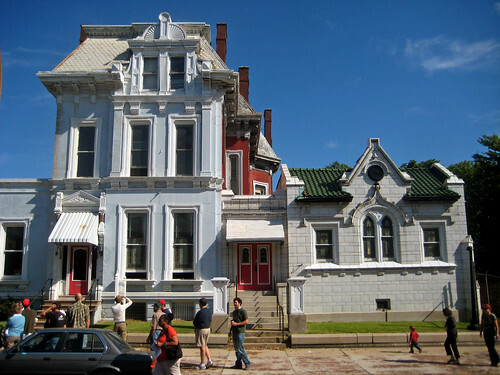 Both are began as high Victorian mansions on St. Louis Avenue's "Millionaires Row" and both were later converted to funeral homes with substantial complimentary additions to the right side and rear of the mansions. In the last several years though the properties have taken dramatically divergent paths as a direct result of their ownership. 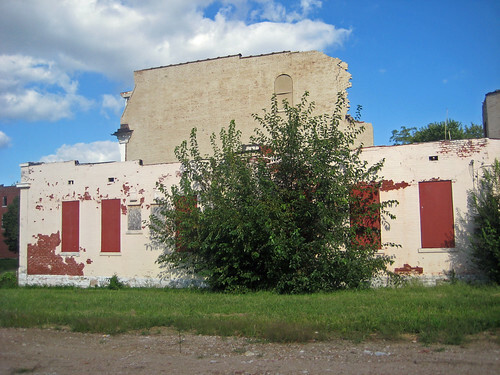 City records show the former Liedner Funeral Home at 2223 St. Louis Avenue under the ownership of the Greater Bible Way Community Church since at least 1997. It is obvious that this stunning property has been lovingly maintained by its current owner. Inside its beautiful woodwork, ornate plaster and stained glass are all in excellent condition. 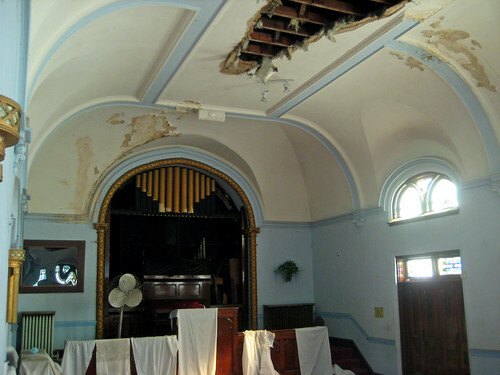 The only minor issue with this building is that some of the plaster ceiling in the chapel addition has fallen due to a roof leak. 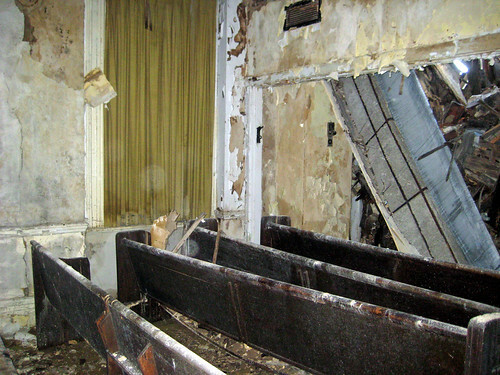 Last Saturday, Reverend Harsley of the Bible Way Church gave the Rehabbers Club a tour of the former funeral home. This immaculately maintained building is currently for sale. The Reverend said that the asking price for the entire complex which includes the 3-story mansion, chapel, parking lot and an additional lot to the east, is $280,000 which seems like an exceptional value. A few blocks east, it is like you are in a different world. 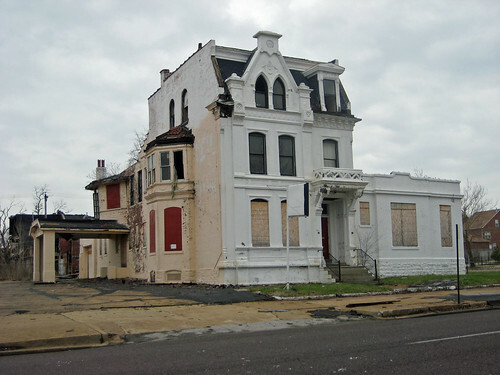 The beautiful former mansion turned funeral home at 1936 St. Louis Avenue stands half in ruins due to the blatant neglect of its owner Paul McKee. 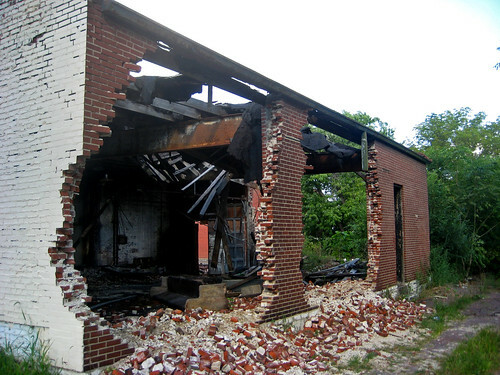 Brick thieves began attacking the garage portion of the addition at the rear of the property and McKee did nothing to secure the property or otherwise prevent further destruction. 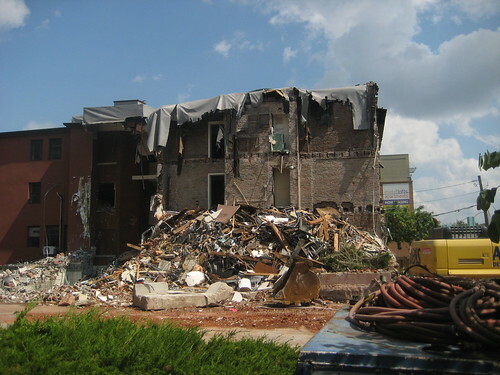 As a result of McKee's indifference, brick thieves have been allowed to attack the building unfettered, destroying the rear of the addition as well as the rear wing of the original mansion. So far McKee has shown little ability to understand how to do development within existing urban neighborhoods and certainly has shown zero ability or desire to protect or even minimally maintain the hundreds of historic buildings that he owns and is ultimately responsible for. Instead of giving $398 million of public money to McKee, right now I would feel confident giving it to Reverend Harsley of the Bible Way Church. Wednesday evening at 6:00 PM is McKee's TIF Commission hearing where he will ask the City of St. Louis to financially back-up his shaky plan to the tune of $398 Million. The hearing will be held in room 208 at City Hall. More details can be found here. If you care about the financial future of the City, please come to the hearing and testify against this proposal. Recently HOK unveiled a proposed design to replace Kiener Plaza and the Morton D. May Amphitheater. The question is though: is this really necessary? 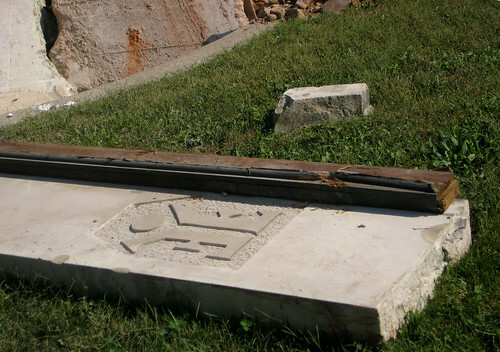 Do we really need to completely re-design our public spaces every few decades? 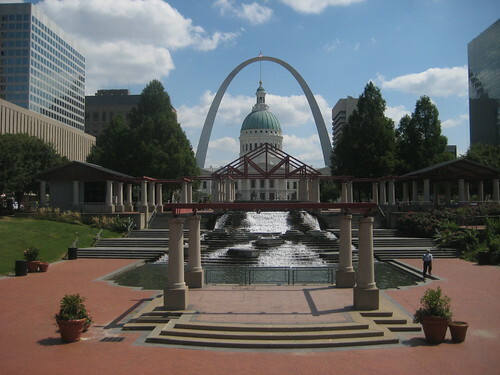 Kiener Plaza which was originally bounded by 6th, Broadway, Market and Chestnut was dedicated in 1966, the same year as the Gateway Arch, so admittedly this block is now 43 years old, but the Morton D. May Amphitheater was dedicated in 1987, a mere 22 years ago. 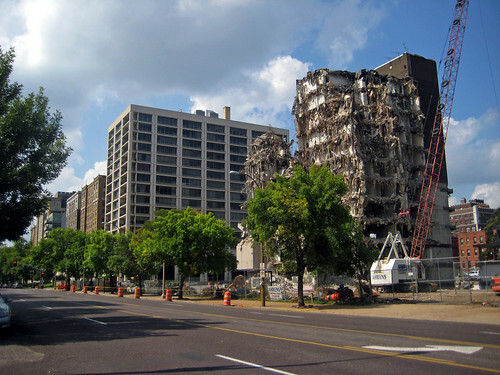 While some might claim that the Kiener Plaza and Morton D. May Amphitheater look dated, we say lets be careful about using such subjective terms and even more cautious about replacing “dated” with the architectural pastiche of the day. While both designs are elegant in their own way, the current design of the amphitheater and the adjoining plaza has a greater chance of enduring over time. The architecture of the May Amphitheater was inspired by the Old Court House, which is part of the National Landmark Jefferson National Expansion Memorial. The proposed design however already looks dated to us. It’s design is reminiscent of images that have been published in architectural periodicals over the last few years. The desires for something new and flashy are symptomatic of the Bilbao Effect. Just like the fashion images from the pages of Vouge, these styles will only be trendy for a few seasons, if that. 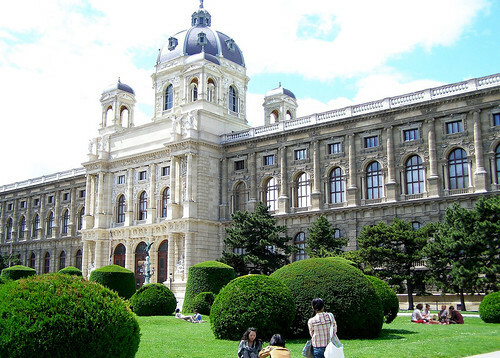 The current designs are more formal, tying into the Old Courthouse and Arch better, and are more likely to endure over time. From a functional standpoint, the May Amphitheater still serves many purposes well on a daily basis. Lunch crowds from nearby Downtown office buildings gather daily to enjoy a bite to eat, catch a few rays of sunshine, read a book or simply to people watch. At Kiener Plaza, the benches that surround The Runner are rarely empty. This is an even better place to people watch due to the number of people who criss-cross the plaza on the way to another destination. For sports rallies and other special occasions, the current May Amphitheater functions very well. The proposed design does not appear to have much slope up from the stage area and would likely not have great sight lines. 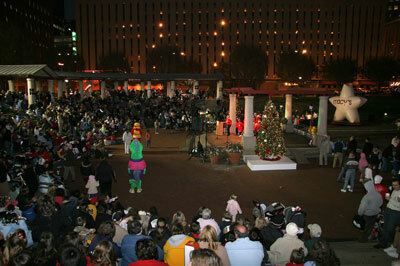 Macy’s Festival of Lights – 2008. 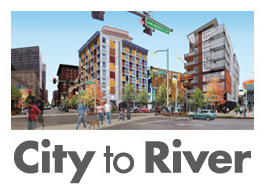 Photo from Partnership for Downtown St. Louis website. The current design of the two blocks offers both intimacy and a large open space for events. The proposed design has a grand feel with an open expanse, but lacks intimacy. This is good for planned events, but it would require those large crowds to feel inviting. 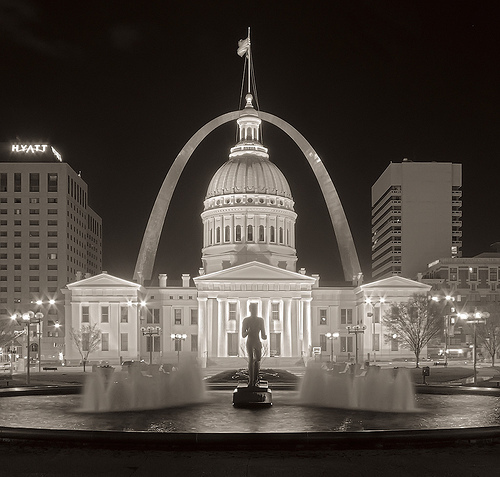 In the present Kiener Plaza and May Amphitheater, a person can feel comfortable even if they are the only one there. The current design offers multiple options for shelter, and better connectivity to all sides and corners of the surrounding blocks. The new design doesn't offer much shelter (and very few trees) and only seems to offer good connections along a NW-SE axis. The present and proposed designs of the two blocks. Then of course there is the cost. 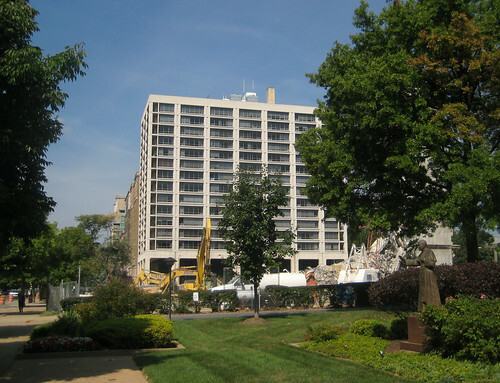 The budget for Old Post Office Plaza was $8.8 million for the 30,000 square foot area, or about $160.00 per square foot. Construction cost for nearby City Garden was $30 million for the 2.9 acres on two City blocks, or about $174.00 per square foot. 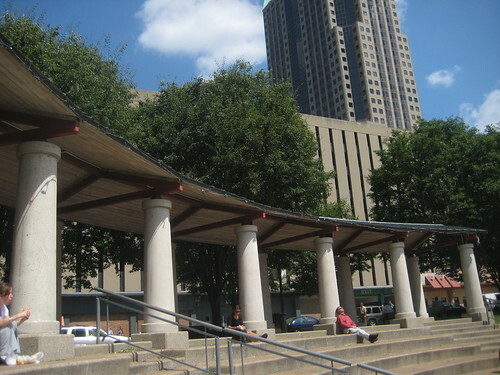 City Garden is about the same size as the Kiener Plaza – May Amphitheater blocks.. Should we spend $30 million to completely replace what we have? No. Spend this on some of the blocks farther west that could really use some attention. Do the existing spaces need some re-furbishing and enhancements? Yes. At the May Amphitheater, the asphalt perimeter paths, likely a last minute value engineering decision, should be replaced with a more appropriate paving, new access paths should be installed where landscaping gets regularly trampled, and new shade tolerant ground cover should be planted under the existing tree canopy. At the floor of the amphitheater and terraces to the south, adding movable umbrella tables would provide an additional shaded seating. The information center building should be re-designed to be more open with largely glass exterior walls. A companion building could be built to the south to house the nearby hot dog and concessions stand. 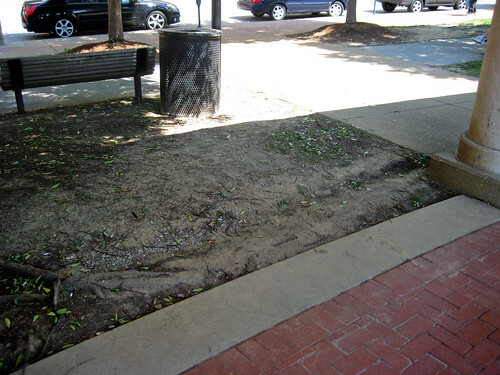 Asphalt paths and lawn areas around the amphitheater need to be addressed. The trees though, which provide pleasant shade and an intimate setting should remain. 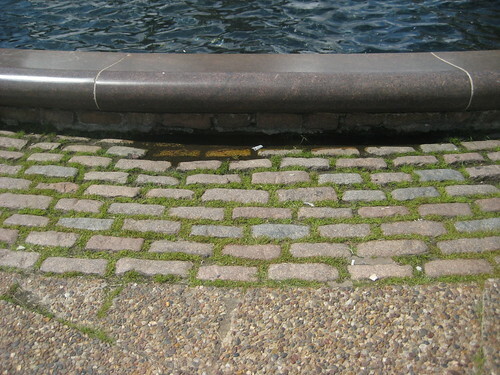 At Kiener Plaza, concrete paving should be patched or replaced with matching where necessary, more benches should be added around the fountain, cobblestone edging and the cobblestone ring around the fountain need refurbishment. The lawn areas east of the fountain do seem to lack definition and could use something to add interest and encourage more use of the spaces. Something as simple as adding large topiaries could break up the lawns into more intimate spaces that are more likely to be used. Cobblestones around The Runner should be re-worked. One of the worst things about these two blocks is the view of the Kiener garages to the north with all the garage entrances along the street. 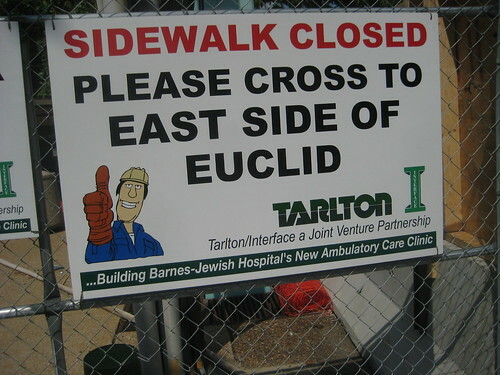 Neither design is at fault for this drawback. At the May Amphitheater, at least the current design shields the majority of the view of with a row of trees. 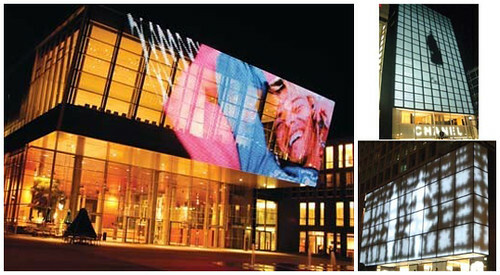 At Kiener Plaza, where more of the east garage is visible, simply stretching a metal mesh with an integral LED array could turn the garage facade into a giant video screen which could be programmed with regularly scheduled movie screenings and video art displays. 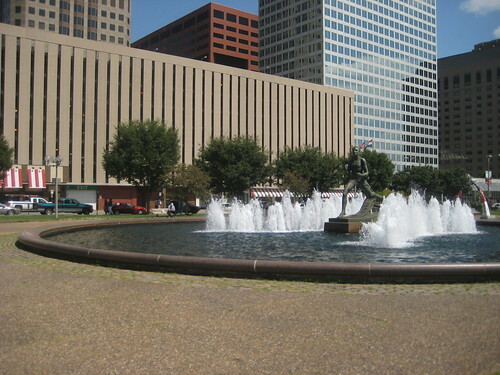 By spending a few million dollars on needed renovations and selective enhancements, Kiener Plaza and the Morton D. May Amphitheater could live up to their premier location. Throwing away everything in these two blocks for wholesale replacement would be extremely wasteful. The only advantages we can see with the proposed new design is that it's new and shiny, bold and flashy. These qualities wear off quickly. 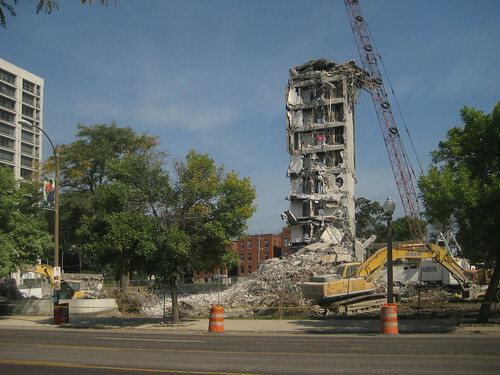 All that remains is the central elevator tower. 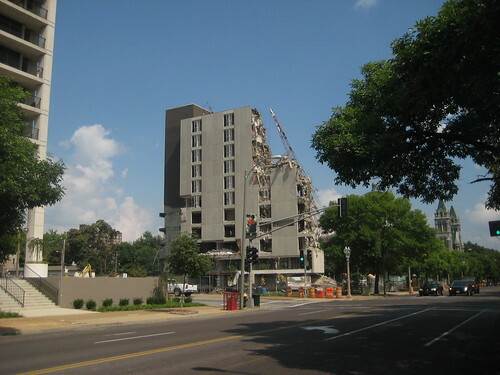 The urban street wall of Lindell Boulevard now ends abruptly at Taylor Avenue. alteration of the building's entrances, lies on the lawn along Forest Park Boulevard. 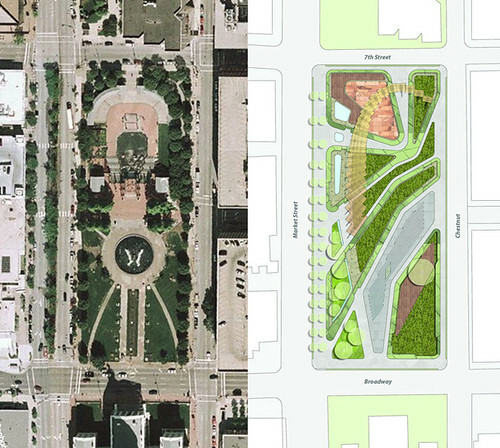 With the recently announced proposal for the complete replacement of Kiener Plaza and the Morton D. May Amphitheater (commentary about that coming soon) I was thinking about what the blocks were like prior to construction of the public spaces that we enjoy today. Last night I attended the opening for St. Louis Through the Lens, the Irv Schankman Memorial Photography Contest which is on display through December 5th at UMSL's Gallery 210. The show is well worth the trip, and for Metro riders, the gallery is conveniently located in just steps from the UMSL North Station, east of the Touhill Center. In the hallway outside the gallery, is a nice display of a few dozen of Schankman's photos from the Missouri History Museum's collection. 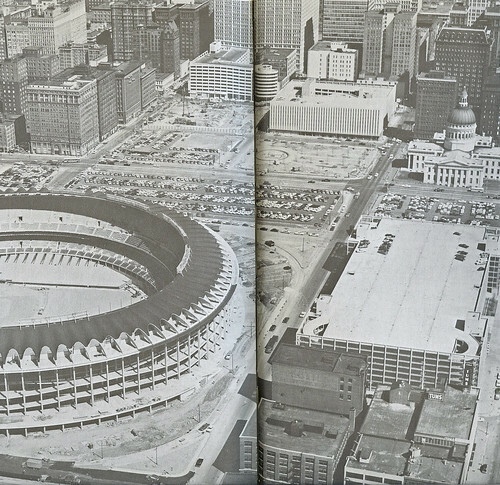 The image from above, either late 1965 or early 1966, captures the construction of the previous Busch Stadium as well as the block where the Morton D. May Amphitheater (visible because the Kiener west garage has yet to be built). Peeking around the corner of the Kiener east garage, form work can be seen for the Kiener Plaza fountain. 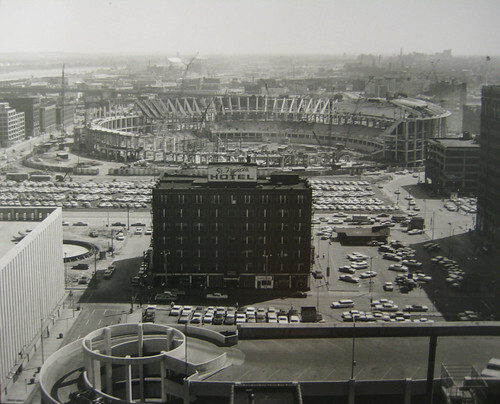 Months later in 1966, the St. Francis Hotel is gone, Kiener Plaza and Busch Stadium are nearing completion and site work has begun for the Kiener west garage. 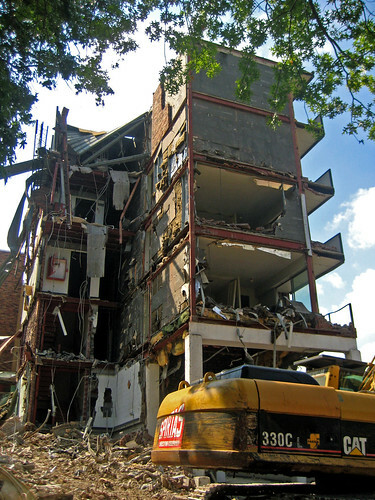 Real Estate Row to the west would remain unscathed for only another seven years. 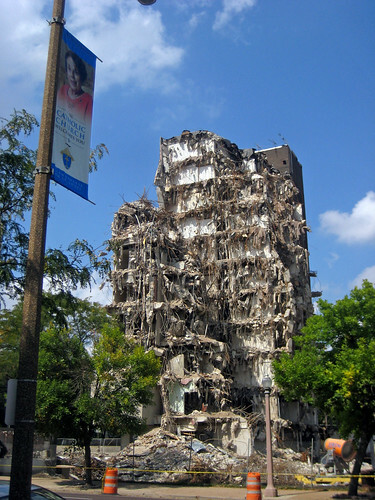 Falling like slow dominos from north to south, The elegantly skinny Holland Building would fall in 1973, followed by the DeMenil in 1976 just north of the surviving Wainwright. Finally in 1984 after much debate, the Title Guaranty and Buder Buildings would be imploded for half-assed extension of the Gateway Mall. 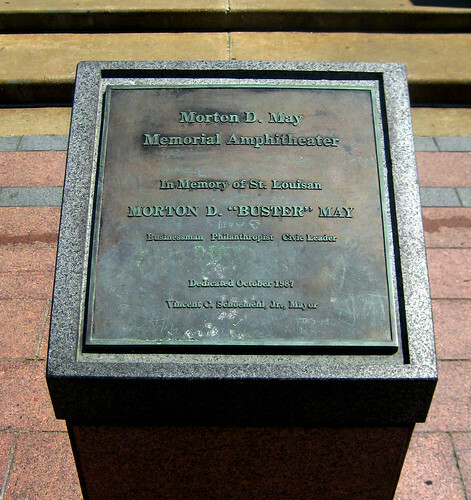 After almost two decades since Kiener was constructed, in 1987, the Morton D. May Amphitheater would replace the surface parking lots just west of Kiener Plaza. 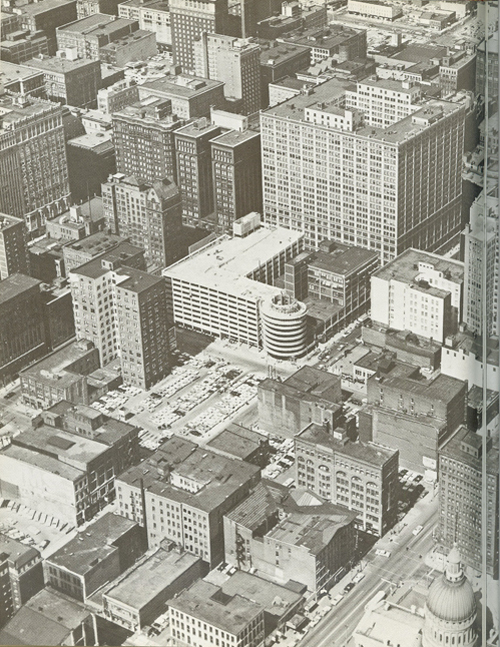 Photos above and below are from This Is Our St. Louis, published in 1970. 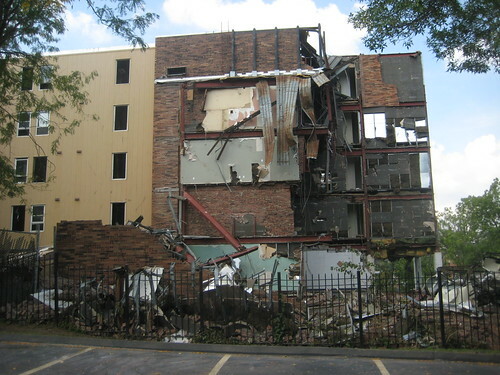 Ettrick Building demolition at 4901 Forest Park Boulevard underway. 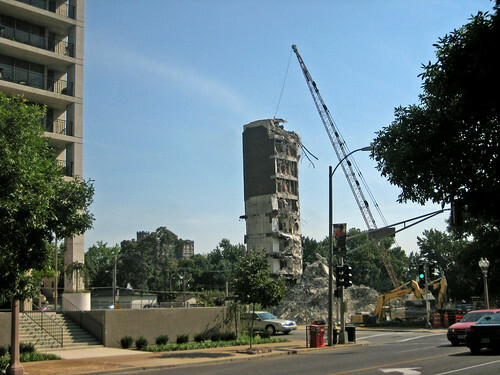 "The Catholic Church Welcomes You"
4483 Lindell will likely be no more than a hole in the ground by weeks end. 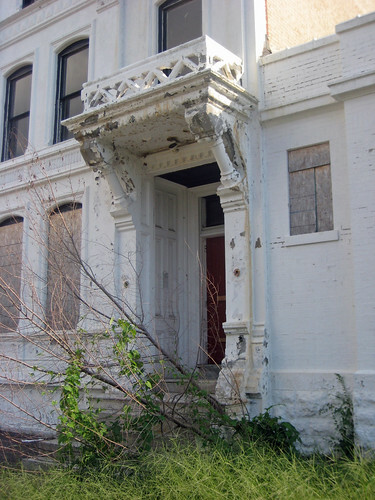 After seeing this post by Ecology of Absence about the destruction by brick thieves at this mansion at 1930-36 St. Louis Avenue, I decided to take an in-depth look at the damage and what is left. 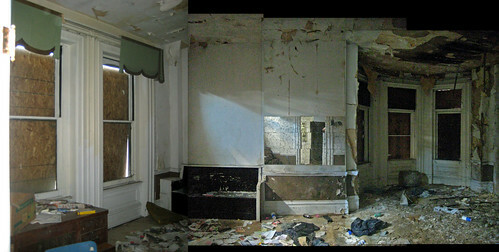 The mansion turned funeral home turned abandoned Bliarmont property was originally constructed in 1873 and is located in the Clemens House - Columbia Brewery National Register Historic District. 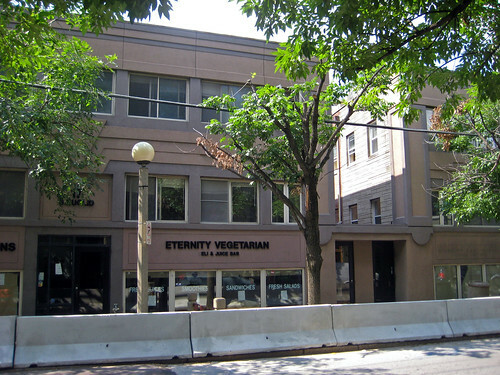 The building should without question be considered a "Legacy Property" in Paul McKee's proposed NorthSide development. 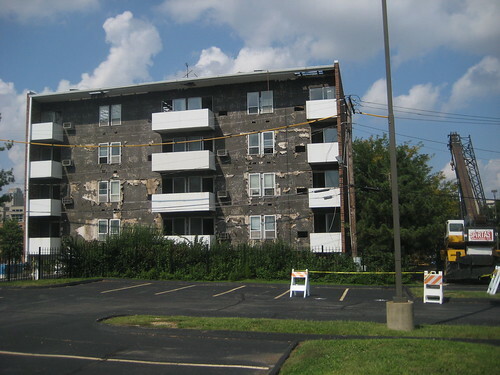 But is this considered a Legacy Property? No one knows, since to date McEagle has refused to divulge the list of Legacy Properties after numerous requests from various stakeholders. Another view however shows a masonry wall between the ell and the main portion of the mansion intact. 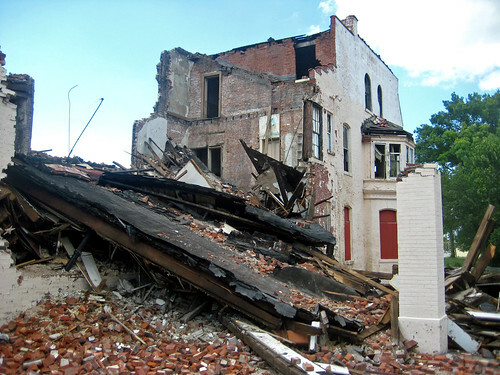 While the rear half of the structure is heavily damaged, the main part of the original mansion, the front half of the addition to the west as well as some of the rear walls are still quite salvageable. 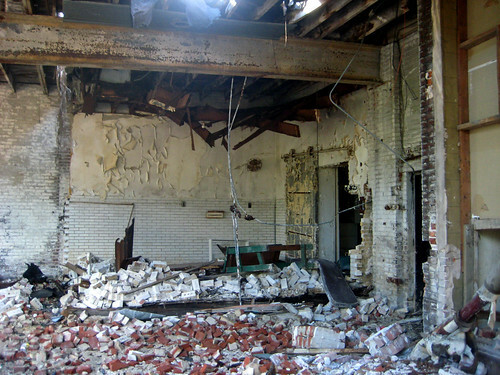 Enough of the structure remains to make the building eligible for Historic Rehabilitation Tax Credits. 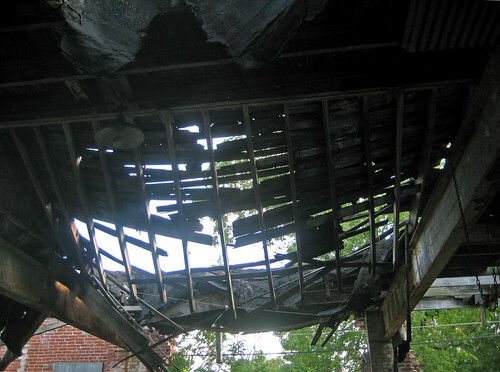 The rear of the of the funeral home garage addition from the alley shows extensive damage, however, the large steel beam supporting the roof structure remains. 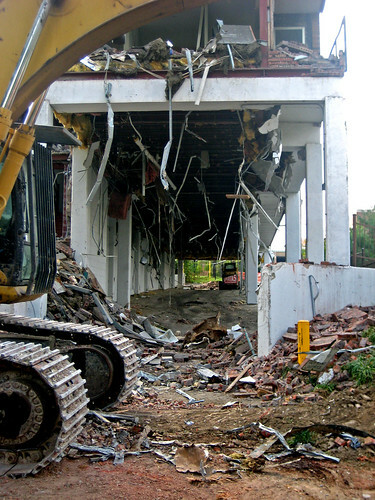 A view from the west shows the west wall of the addition fully intact as well as the main portion of the mansion. 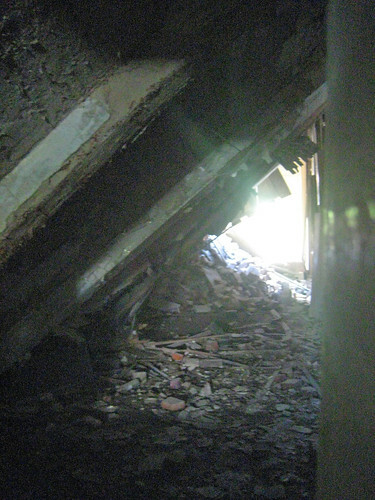 Inside the garage it is evident that deterioration of the roof had already taken place prior to the brick theft. The roof itself is easily re-buildable, and the wall could be re-built as well if a new user wanted to retain the rear garage. 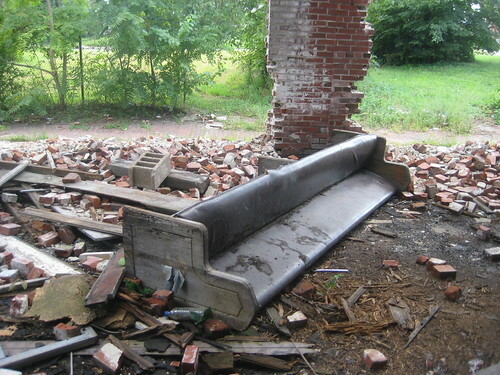 A pew from the funeral chapel is left lying in the rubble. 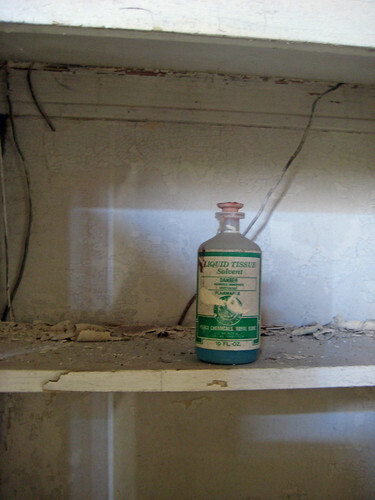 A white glazed brick enclosed room has been completely opened on two sides by the brick rustlers. 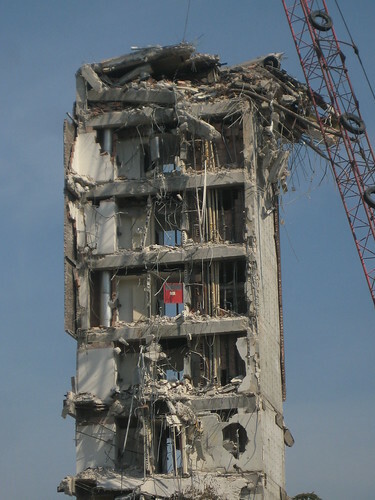 The missing walls however appeared to not be load bearing as the large steel beam and roof structure are intact. 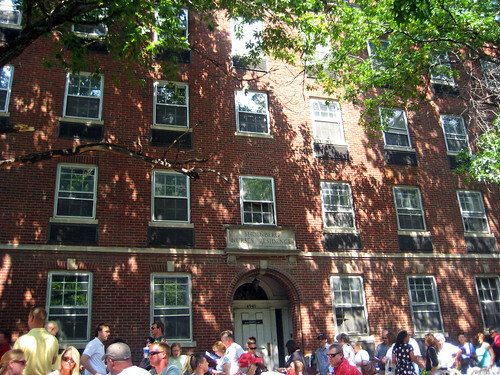 Middle portion of the west addition. 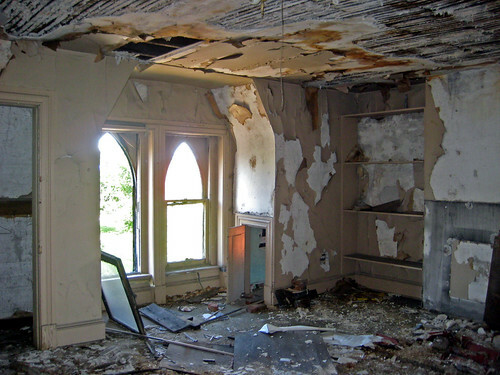 Though plaster has fallen from the wall and ceiling, the structure is unscathed for now. 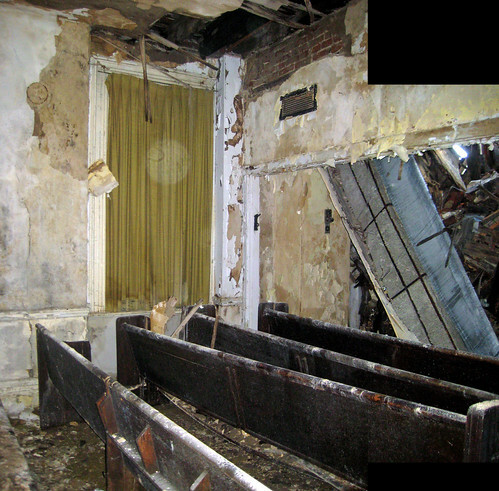 View into what was the chapel in the rear ell of the mansion. Much of the west addition was at one time separated from the main structure by an exterior gangway which was later fully enclosed. The rear of the chapel in the surviving main portion of the mansion. The masonry wall above the opening divides the main structure from the damaged ell. The front parlor of the mansion with the bay which protrudes to the east. 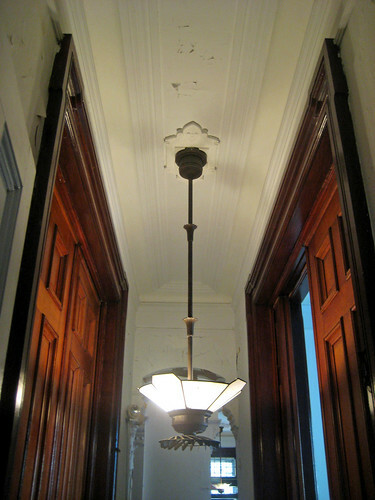 The front hall of the mansion. The main stair to the second floor was relocated to the west, outside the original west wall, likely to open up the front hall, which led directly to the funeral chapel. 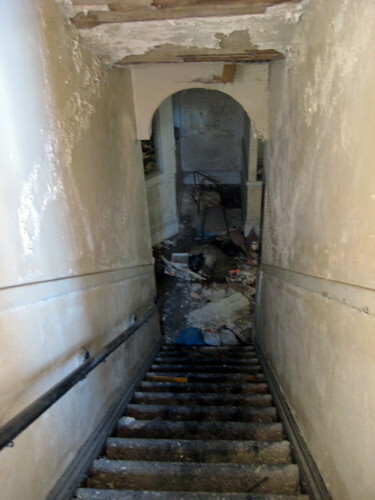 The stair aligns with the now enclosed gangway farther back in the building. 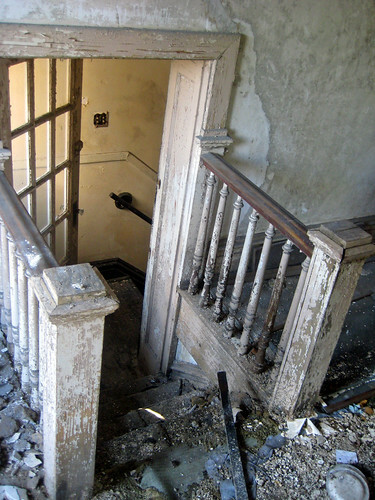 The stair returns into the original mansion at the second floor. 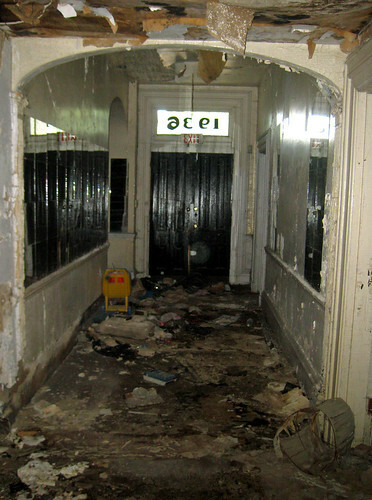 A view of the devastation from the 2nd floor hall. 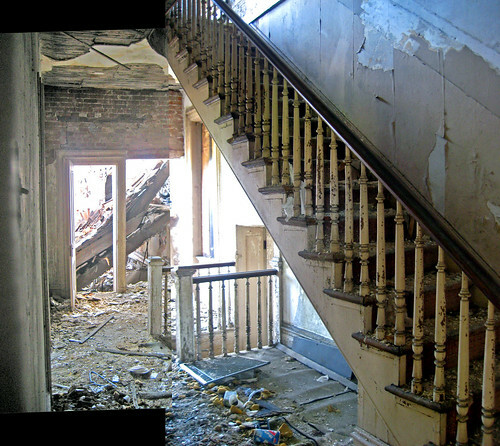 The stair to the third floor remains in it's original location. 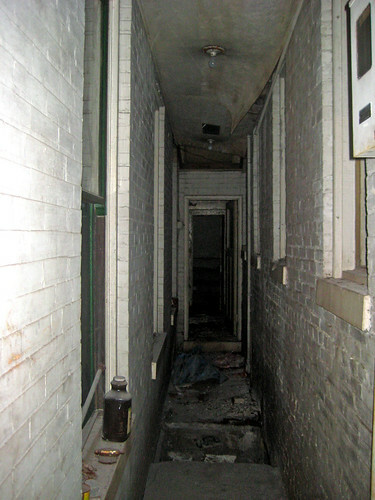 A view of the rear of the large second floor space. 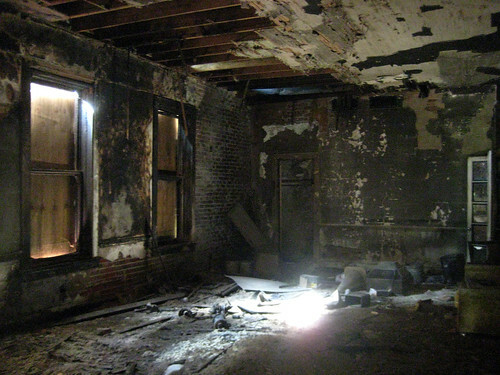 The front of the large room in the main part of the mansion. A view from the window above the front entrance. 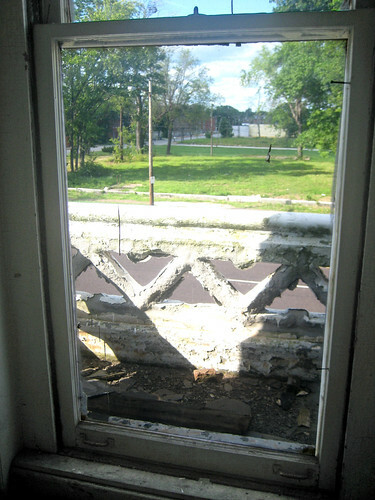 Beyond the ornate balcony rail is the vacant lot which was the site of St. Paul's Methodist Church, which was demolished in the late 1990s. 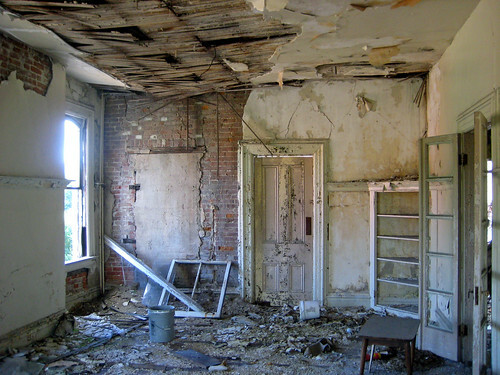 The front room of the third floor. 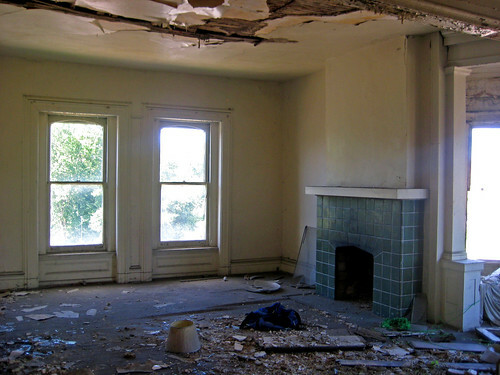 While somewhat of a mess, the condition of this room illustrates that the mansion at 1936 St. Louis Avenue is far from the condition where total demolition should be considered. As part of their $410 million TIF application McEagle shows revenue of $149 million from Historic Tax Credits. In order to achieve anything close to that number, McKee will need to do historic renovations of this mansion and likely all other properties on the elusive "Legacy" list. 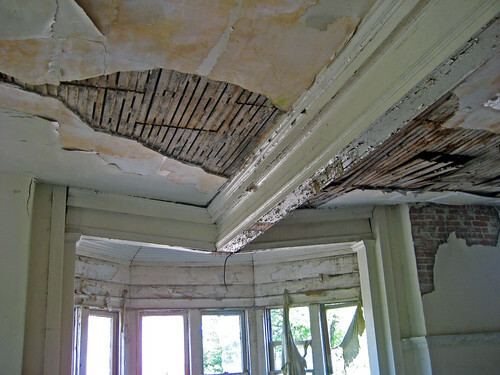 The fact that a grand historic property has been allowed to fall into this condition is inexcusable, especially in the hands in the hands of someone asking for $410 million in tax revenue to support his project. 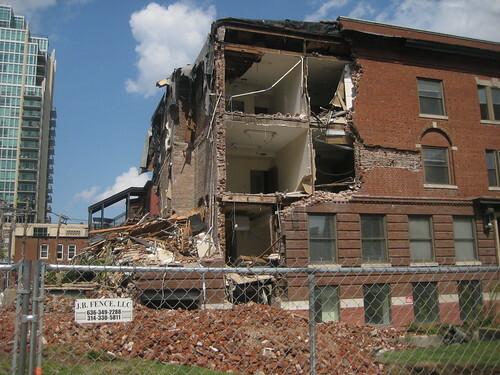 The Board of Alderman and Mayor Slay should not consider giving McKee, who happens to also own a large construction company, one penny until he secures buildings like this and prevents the wanton destruction that has occurred here.